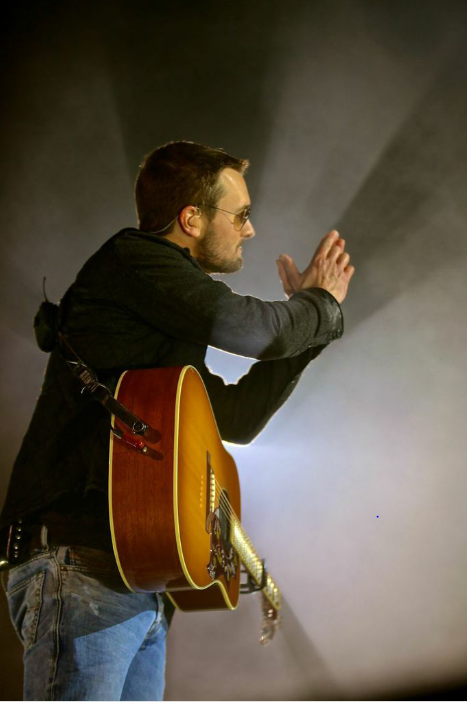 Eric Church commands the crowd at EnergySolutions Arena in Salt Lake City, Utah on January 31, 2015. SALT LAKE CITY, Utah – (Feb. 1, 2015) – Eric Church knows what a bummer it is to have your Saturday night plans ruined by a concert cancelation. So rather than pull the plug last minute on his show in Salt Lake City Saturday night after a stomach bug knocked out most of his band and crew, Church gave the crowd something special and promised them more to come. He then announced he’d be back Memorial Day, Monday, May 25, with a full band, and launched into a mostly solo set alone on a stage built for eight with just his acoustic guitar. He gave his fans a stripped-down performance reminiscent of his days as a scrappy club performer. Back then, Church would give his band a break during their six-hour sets and hold the stage alone. Church played acoustic versions of current hits “Give Me Back My Hometown,” “Drink In My Hand,” “Cold One” and his most recent No. 1 hit “Talladega.” He also played deep-cut favorites such as “These Boots,” “How ‘Bout You” and “Livin’ Part of Life” from early in his career. Halestorm opened the show with a full 45-minute set. The production and stage were scaled back – only four spotlights and a minimal floor lighting package showcased Church in this unique setting. Guitar players Jeff Hyde, Jeff Cease and Driver Williams joined Church for a few songs and Lzzy Hale came onstage for a remarkable acoustic rendition of “That’s Damn Rock and Roll.” Church worked six mic positions (scaled back from the normal 14), still performing to every section of the 360-degree setup. Fans looking to experience Church’s prowess as a live performer have a unique chance to catch him at the GRAMMY Awards on Feb. 8 at Staples Center in Los Angeles. The North Carolina native is up for four GRAMMYs, including Best Country Album and Best Country Song, and will play a yet-to-be-announced song on the CBS broadcast. Supporting acts for the May 25 bonus show in Salt Lake City will be announced at a later date. Fans wishing to attend should hold onto all physical tickets. Those unable to attend that show can seek a full refund at point of purchase beginning Wednesday, Feb. 4, until 5 p.m. day of concert. Tickets are available at www.ericchurch.com, all Smith’s Tix outlets, www.smithstix.com, the arena box office or by phone at (800) 888-TIXX or (801) 467-TIXX. To learn more about Church, visit www.facebook.com/ericchurch, or follow @EricChurch on Twitter.